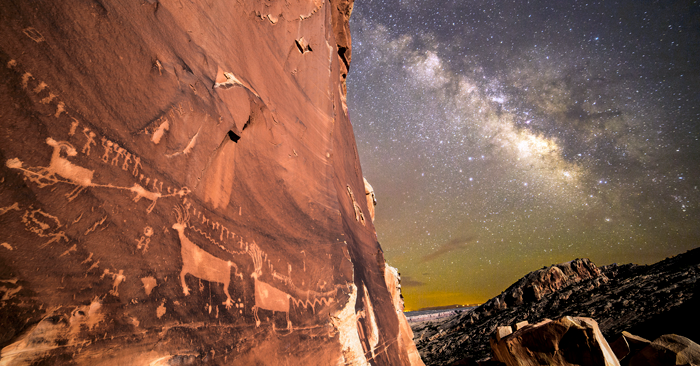 The Milky Way rises over the proposed Bears Ears National Monument, Utah, U.S., while prehistoric Native American petroglyphs grace the rock panel at left. Photo by Marc Toso. Most of the proposed 1.9 million-acre Bears Ears National Monument in southeastern Utah is blessed with extraordinary dark skies. For at least 12,000 years, from paleo-hunter/gatherers to modern farmers, ranchers and townspeople, billions of stars and galaxies twinkling above have inspired wonder and mythical tales … dark skies now threatened by unshielded lights in towns and around mining and drilling operations. Help protect Bears Ears now by heeding this call to action! What the first people thought of the starry night sky is lost behind the veil of time, although there are a few intriguing, enigmatic pictographs that possibly depict celestial events. Perhaps these ancient nomadic people also used the stars for navigation across the vast, rugged canyon country. Once the hunter/gatherers evolved into agrarians to grow corn, beans and squash, the people no doubt took a deeper interest in the movement of the sun, moon, and stars to help them determine when to pray for rain, when to sow and when to harvest. Pictographs and petroglyphs along with some buildings mark the annual solstices and equinoxes. Other structures, sometimes associated with natural landscape features, seem to record the major lunar standstill, a 18.6-year cycle of the moon’s path across the sky … a remarkable recognition of a celestial event and an amazing engineering feat to measure it. Some rock art may be records of major celestial events such as Halley’s Comet in 1066 or the Crab Nebula Supernova, which occurred in July 1054. The native people, the Navajo, Ute, and Paiute, that still occupy southeast Utah have a rich cultural affiliation with the night sky. The stars are living supernatural beings that embody the rules for living. The Navajo word for constellations is “So’ Dine’e,” which translates to “Star People.” A Navajo string game is played that tells the story of how Black God, First Man, and First Woman were slowly, carefully placing stars so that the people could tell time and age. However, Coyote, ever the trickster, was becoming impatient. He grabbed the blanket, which held the remaining stars, and flung it up into the sky. Thus we have patterns of constellations set against a seemingly haphazard spray of stars. The Utes see the Milky Way as the Ghost Road and Pleiades as Coyote’s family. The Paiutes see the North Star as Qui-am-i Wintook, who on Earth was a bighorn sheep but now resides in the sky as a poot-see (star) to shine and be a stationary mark to guide all living things on Earth and in the heavens. There are other bighorn sheep in the night sky (the Big Dipper and Little Dipper). They go round and round seeking the trail up to Qui-am-i Wintook. The Hopi, whose ancestors built many of the thousands of pueblos and cliff houses in southeast Utah, use constellations such as the Pleiades and Orion to time various rituals. Certain constellations sometimes appear on masks, katsina dolls, and other ceremonial objects. Within the proposed Bears Ears National Monument is Natural Bridges National Monument, which was the very first International Dark Sky Park. The National Park Service Night Sky Team rates the monument’s sky as a Class 2 on the Bortle Dark-Sky Scale, which is a nine-level scale of brightness. Class 2 is about as dark as it can get unless one is deep inside a cave. Another nearby dark sky park is Hovenweep National Monument, a mere 784 protected acres, but does contain numerous Ancestral Pueblo towers and structures that align with celestial events. We have a rare opportunity to preserve the dark skies of southeastern Utah. Currently only a handful of small towns occupy the region. Hopefully, each one will eventually want to become dark sky compliant. The importance of naturally dark skies for cultural, spiritual, and health reasons cannot be denied. Designating the Bears Ears National Monument soon and managing its awesome, pristine night skies would be a special gift to the people who live there, who visit, and to future generations. Stewart Aitchison has been exploring, studying, and writing about the Colorado Plateau for more than five decades. A former field biologist with the Museum of Northern Arizona, he has been a naturalist on educational excursions for National Geographic, the Smithsonian, and other organizations for 35 years. Aitchison lives part-time in Bluff, Utah.